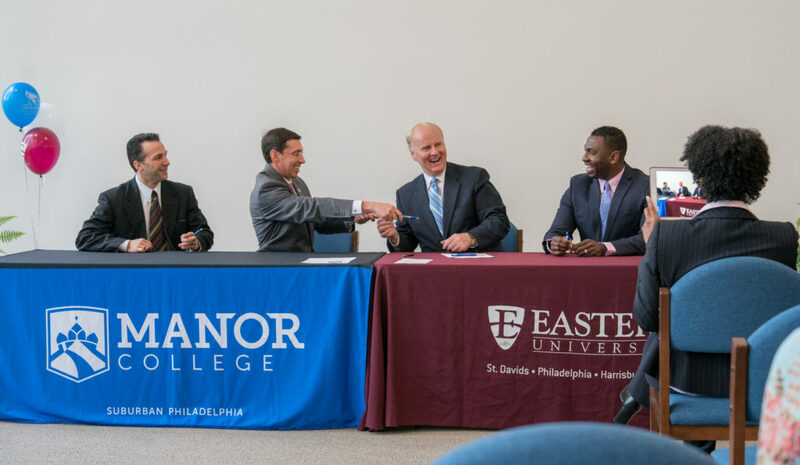 President Peri (center) trading pens with Dr. Duffet (center) during the signing agreement that officially makes Eastern University a University Center partner offering Bachelor’s degree in the field of Early Childhood Education as well as a certificate in Special Education from Eastern. 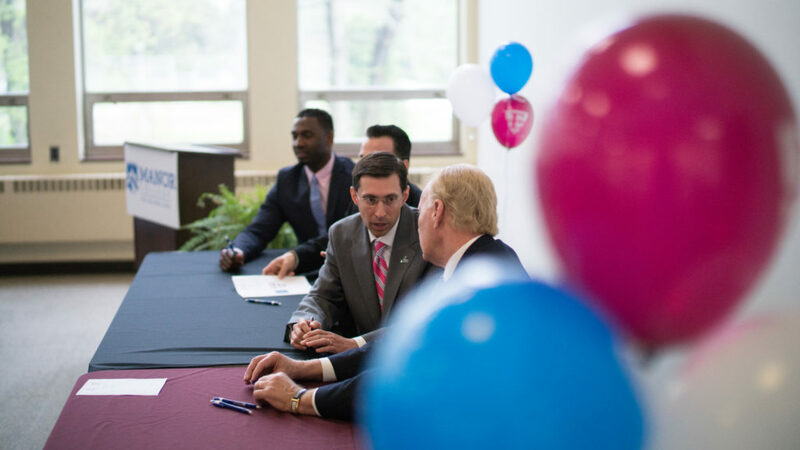 Pictured left is Dr. Stephen Grieco, Interim Vice President of Academic Affairs and pictured right is Mumia Parham, Executive Director of Strategic Partnerships and Alliances at Eastern. Eastern is now the fourth school to enter into this program, joining Alvernia University, Immaculata University and Widener University. The University Center serves as a resource for students to complete their associate, undergraduate and graduate degrees, all while taking advantage of the location, quality education and values Manor College is known for. Manor partners only with top accredited universities and colleges, and the degrees earned hold the same value as if they were earned on the home campuses of the partner schools. “What makes our University Center unique is that students can complete their degree right on our campus and receive added benefits such as exclusive tuition discounts and seamless transition with no additional application required for most programs,” Dr. Stephen Grieco, Associate Dean of Academic Affairs, said. After the signing, Dr. Robert Duffett, president of Eastern, extended his gratitude and excitement about the new partnership. Students in this program will be able to enjoy the benefits of taking classes on Manor’s college, like the free parking, cafe options and the resources found in the Basileiad Library. For more information on Eastern University visit eastern.edu.